Another week and that means it’s time to introduce another great guild. This week we get to meet and learn about the guild Pandamonium. Yes, that is spelled correctly and no, there are mentions of monks or any hints of mist to speak of. What this guild is about is having fun and staying fairly casual…as casual as a guild with 6 raiding teams can be. No, seriously this is a great bunch of gamers, who do keep it casual even if they do take pride in endgame content. I’m not sure if any of them were aware, but I had an opportunity to group up with some Pandamonium’s members in the Black Hole area. This was a couple of weeks ago, but they were a fun bunch to group with, even if it was only for the End of Torvix Heroic. A fairly simple Heroic, but it takes teamwork and it wasn’t long before I could see they had no issues communicating even to those not on their voice-chat. Okay, enough of my stories, time to meet the guild Pandamonium. How did your guild come up with the name Pandamonium? How does this name fit with your guild’s faction, playstyle and your membership? Amawyn: We were brainstorming names and Pandamonium came across the best as the embodiment of what we stand for: fun, a little chaotic, cool sounding, and we had used the name before casually and already liked it. Keshi: There is so much random stuff going on all the time; just look at the “hijack this thread” thread on our forums and you’ll have a pretty good idea as to why the guild’s name is appropriate. Kaisa: I blame Ambrosine. When there were just a small handful of us chit-chatting about creating a SWTOR guild last summer with a desire to start fresh, she was the one that came up with our new name…Strangely fitting. Who was the person or were people behind getting the guild started? 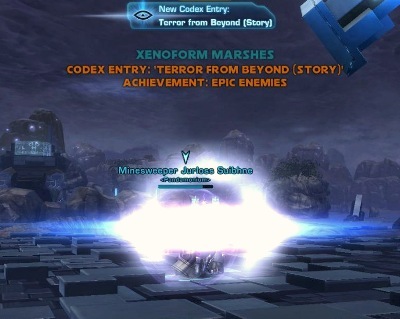 Star Wars: The Old Republic is not the first game for this guild; can you tell us some of the history of your guild? Does the guild participate in other games since joining SWTOR? Kaisa: The core of Pandamonium is comprised of a group of wonderful friends who have been playing together in different games and under different guilds for many years. Since 2004 for most of us, though some of these friendships go as far back as the late 90’s playing Ultima Online. We’ve been having annual real life guild meets since 2006. Just this past August we met up in Boston. Last year it was New Orleans. As for games, much of our more recent time has been spent in EverQuest 2, with a brief foray into WoW. Though people are welcome to explore other gaming options on the side, we have no plans to become a multi-gaming guild. We have learned over the years that it is ultimately healthier for the guild and its leadership base to focus on one primary game at a time. Your guild use to be located on the Corellian Run server. Where is the guild located now after server consolidations? How did server consolidations go for the guild and for your members? How do you like your new server location? Grym: The transition itself was painless for me, aside from losing the last of my original names. I do find the new server to be more prone to lag during Sunday/Tuesday raids. On the upside, queues for Warzones and FP’s pop a lot faster. Amawyn: We actually started on Darth Bandon, then got merged into Corellian Run, and finally now to The Shadowlands. We were a little anxious each time we moved on how it would play out, but it turned out surprisingly well. We ended up with a full server with active instance and warzone queues and many more people to encounter, and all that, with no additional lag, disconnect, or long queue issues that usually plague such moves. Keshi: Was definitely concerned about the server merger being handled in a similar fashion as the first (from Darth Bandon to Corellian Run). Thankfully, some common sense was applied to the naming process and the move over to The Shadowlands was relatively painless. I’m excited about how busy the GTN is now (much easier to sell inventory and more options for purchasing). The only downside is increased competition for world quest objectives and farming (makes it harder to get through some quests quickly). How excited is Pandamonium about Patch 1.4? What are some of the elements your members like the best in the new patch? What are some elements you all find that need some fixing or attention? Amawyn: The new Operation, Terror From Beyond, adds some more and much needed raiding content. We are all excited to fight new encounters and so far the direction it has gone looks very good. Keshi: The Group Finder lets us go back to our original questing which makes the whole process more enticing. Terror from Beyond is a super fun Operation (especially the puzzle boss) and I look forward to the challenges of HM. I love the fact that they reduced the cost of ripping out mods; that cost was getting ridiculously expensive if you did it more than a few times. What would you say is the guild’s primary focus in SWTOR? How does the guild manage to balance the needs for preparing properly for endgame content and supporting more of a casual approach? 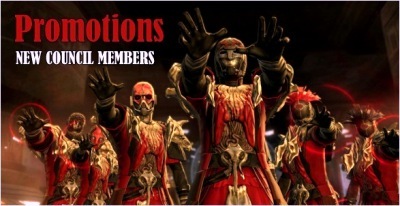 Amawyn: Our initial primary focus in SWTOR is a casual, fun, social community. But the membership evolved and the guild evolved with it. So now instead of merely having “some raiding opportunities”, we are fairly involved with endgame raiding with 6 active and successful 8-man teams. We cater to all schedules and raiding preferences. For those starting out and gearing up, they can dabble in the Monday night guild pickup op. For those wanting more action and difficulty, many of the 6 teams will need a substitute player in any given week to cover absences. And then the set teams themselves for those more dedicated who want to raid 2 or 3 days a week. So we cover the spectrum and we have a plan to get people where they want to be. Keshi: The organization/scheduling of Ops raids has shown me the endgame content mentality, whereas the raids themselves really support the casual approach. We’re very much focused on downing bosses and gearing up, but the Mumble channel is usually filled with laughter or good-natured harassment of each other’s performance. That and we frequently strip down during Ops just for the sheer ridiculousness of it (especially for those cut-scenes). Kaisa: Aside from what Amawyn and Keshi have mentioned above, we have also been known to crank out parodies, raid videos, short films, and the like. It’s just another way for us to express our love of the game. Kreep is in the middle of working on the second installment of his Quintessential Conversation video series. I recently completed a new music video, Into the Vault. We also regularly post boss kill videos to help up-and-coming raiders. Subscribe to our YouTube channel if you want to know more. Let’s check out this one of a kind music video, Into the Vault. Having mentioned “casual” some may not think you all are prominent in “true” endgame progression. For the record, can you tell everyone how Pandamonium is doing as far as progression throughout the various Operations? Also can you tell the readers how many operation teams your guild is running on a scheduled basis? Amawyn: We haven’t thought about progression in terms of rankings and such since that is not what we are about, but we have 6 teams. Four teams have defeated hard mode Explosive Conflict weeks to months before this latest zone came out. And the 2 that haven’t were recently formed with one in the early stages of progression and one in the middle to late stages. This actually helps us cater to the different schedules. So we are doing very well in progression. Kaisa: Though many describe us as a “casual” guild, our primary focus is definitely on end-game raiding, and the numbers speak to that. 50% of our members raid, at a minimum, twice a week. We may not be shouting our progress from the rooftops, but we are definitely competitive. As of this writing, several teams have already cleared storymode TFB, and at least one team has cleared the first two bosses on hardmode. 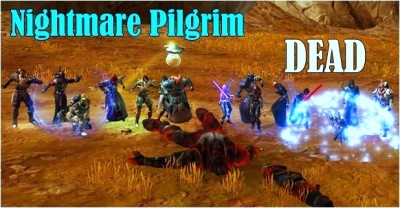 Along these lines, the guild took down one of the tougher in-game bosses, the Nightmare Pilgrim, in the past month. How did that event go and any tips for this boss…only fitting we discuss this boss as it is nearing Halloween? Grym: The keys to NMP are preparation, communication, and awareness. Everyone needs to show up with an idea of what they will be facing, and bring consumables. The raid leaders need to know who will be healing what, and which tanks go where. During the fight, the tanks in particular need to be vocal about debuffs and who is going where during tank swaps. The rest of the raid needs to maintain awareness of interrupts, the kick/shield, and their own debuffs. Amawyn: Nightmare Pilgrim is pretty unforgiving and challenging until you are more practiced. Since it requires 16 players, there is a greater chance of someone making a mistake. At the same time, mistakes on this fight get you killed immediately. You’ll need good damage to beat the enrage time where he goes crazy and kills everyone; yet at the same time there are stretches of time where a shield or debuff is out that you cannot damage them or immediately get killed. The fight smooths out dramatically when the tanks know when to swap, when the dps are able to help interrupt the “Thing’s” heavy damage Gore attack, and when the raid can do enough damage to beat the enrage time. If you lack any of the above, it makes the fight much more difficult. Your guild places real life over anything in-game, as most guilds do, but the guild does hold true to commitment. How has this philosophy been looked at by your membership? Do you find that holding people to their commitments has benefited the guild? Grym: We do hold people to their commitments, but there’s very little actual “policing” involved. People tend to show up when they say they will because we are a mature guild that understands personal responsibility, and we enjoy playing with each other. Also, because we limit our raids on purpose, we avoid burnout. That is, people are typically willing or even eager to participate because they’ve had some downtime in between commitments. Amawyn: The two seem to be at odds, real-life and in-game commitment, but we set things up so that they do not have to be. For example, raiding in other games we have at times raided 3 or even 4 nights a week. That was nearly 20 hours a week. With that kind of demand, it certainly does become a conflict. Even those who enjoy and can raid that much feels the strain over time. 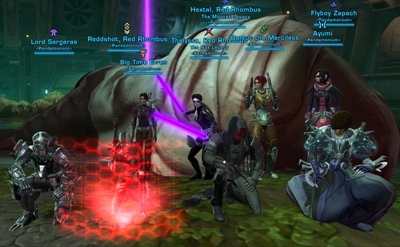 But most of our current teams run only 2 raids a week in SWTOR or 6 hours a week. So if the schedule works out, we find the best fit and expect full commitment. And it goes well beyond raiding – those who do not fit have moved on; and so those that remained, even though we are a fair sized guild, are very committed to the guild and each other. It’s not really commitment after a point; it has evolved into lasting friendships. Keshi: My raid team takes a 15-20 min break both nights each week to allow two of the members to put their kids to bed. Never once has anyone ever reacted in a manner that implied frustration or not understanding. People have had to drop out of commitments due to real life issues (family emergency, pet passing away, work, etc.) and I’ve yet to see anything but warm wishes for each incident. And I think that this approach has actually helped solidify commitment from the members; knowing that if I really need to drop out, people aren’t going to ostracize me. And because people understand, it makes me not want to let them down. Pandamonium has a member ranking system. Can you explain this system and how it is used in bringing alt characters into the guild? Amawyn: We have a fairly simple structure. A newly invited person is an Apprentice. After 4 weeks if there are no problems, they are promoted to Saber or full member. Those members with a security key are Knights and have access to the guild bank. Once a Saber or Knight, a member can bring any number of alts into the guild which will also be the same rank. Those that want to contribute more to the guild and volunteer to run events or help with day to day things are promoted to Archon. And those with the most duties and responsibilities are the Councilors. As we get closer to November and SWTOR’s addition of a Free-to-Play model how has this been perceived by fellow guildmates? What concerns or benefits does the guild see to this change? Amawyn: I do not like free-to-play in general with the heavy use of micro-transactions and more complex pricing. But it is understandable why they would go that route. It’s an industry shift and more games adopt it because it is obviously successful. However, I think it will prove to be less and less lucrative as more games go free to play. It’s a way to differentiate and expand the customer base with the lowest price point. You get more people to try your game. But I think if you extrapolate the market forwards you quickly realize that if everyone is doing it, you are no longer differentiated. And if everyone is doing it, you will bring in fewer and fewer despite being “free” and those you do attract will be turning over quicker. Free is also self-damaging to the brand. For our guild, I see very few changes. Since we will be using the end-game structure, we will still be on a similar if not same plan. Keshi: I, for one, am very excited about F2P. Granted, there are going to be some stereotypical newbies logging in at Day 1, but those individuals won’t be long for SWTOR and will eventually move on. But I think the majority will be good players that have finally had financial restrictions lifted. I’m also excited to see what custom gear and quality of life options are available for purchase with Cartel monies. Is Pandamonium currently recruiting? If so what requirements must potential members meet to qualify for the guild and how is the best way to submit an application or get a guild invite? Amawyn: We continually leave the door open although at times we more actively or less actively recruit. It’s actually part of the secret ingredient that makes us successful. In a social community, new members bring excitement, new ideas, different perspectives, and fun interactions. Keshi: Pandamonium is open to just about everyone. Be mature and courteous; that’s what I like to see. Kaisa: You see many guilds out there who advertise themselves as drama-free, but you quickly find that rarely to be the case. When you get a large group of people working together it is inevitable that drama and dissension will sometimes occur. I believe the key to a successful guild is having a structure in place to handle such issues with they do occur. We have such a structure. Ask any of our members, and they will likely all agree that this is about as drama-free as a guild can get. For the most part we are all older adults just looking to have some fun together. We most definitely succeed at that. To apply, potential recruits should head over to our website and read over what we are about and submit an application if they are interested. It is hard to believe some things we read online nowadays. It seems for every three links, saying one thing, four more are saying the exact opposite. That is the great thing about interviewing these guilds. They are pretty much what they say they are. So, when you read that Pandamonium is a casual guild and yet has six raid teams…you can believe they are casual. They like to have fun and enjoy playing SWTOR. If you are into endgame content and yet want to have a life outside of the gaming world, you should give the gamers over at Pandamonium a try. Thanks Kaisa for helping get all the information from those who provided their answers and then passing them along to me. I also want to thanks those who submitted their answers to help us learn more about your guild. I wish the members of Pandamonium all the best in everything they do.